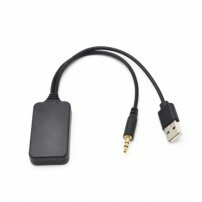 USB & 3.5mm AUX to Bluetooth Audio Aux Adapter Cable For Car BMW & Mini Cooper [CAR005966] : Onchee.com - the accessory shop for all your handheld Electronics! USB & 3.5mm AUX to Bluetooth Audio Aux & USB Male Adapter Cable For Car BMW & Mini Cooper. It is a plug-and-play wireless Bluetooth music adapter designed for BMW with original or aftermarket USB or AUX-IN integration systems. Allowing you to effortlessly read, display and control your phone / tablet music library wirelessly via your car display. communicate with cell phone and tablet. Compatible with all the device with Bluetooth functions. - Support pairing two smart devices at the same time. - This is similar to CAR004858, but not the same product.